Last week, A. and I visited the Brooklyn Museum to see the War/Photography exhibition. I expected to be surrounded by gory images of death, but was instead lost in the walls of photos, article clips, and book pages showing the human race at its best and worst. I found myself wondering what on earth drives us to destroy each other, what motivates people to rip others of their rights and lives. When I entered the In Memoriam room, I just stood in front of the long list of journalists and photographers we've lost in combat. Men and women who were so dedicated to sharing these stories that they risked their lives for it. Sad thing is, while many might have died due to the dangerous nature of war, recent names are those of journalists who have been targeted, silenced. I felt like such a hack in front of that black wall. These were the people who chased those stories even if it came at such a high price. The exhibition was not only a history lesson, but also a chance to show how photographers get up close and personal during some harrowing and inspiring moments, the stories behind iconic shots, and the role photography played in the art of war. It was a display of human emotion, compassion, how military men and women deal with the stresses of combat while trying to retain some sense of normality in their lives. The walls lead you through the experiences of recruitment, training, embarkation, daily routine, battle, death and destruction, homecoming, and remembrance. Some scenes and the accompanying stories were so heart-wrenching, difficult situations I couldn't imagine having to live through, but they were all someone's reality. 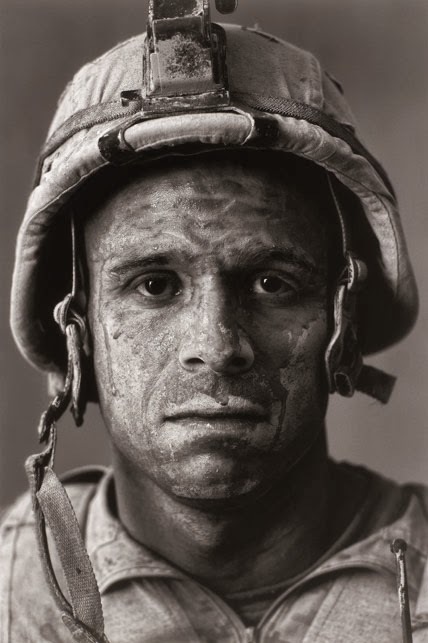 War/Photography: Images of Armed Conflict and Its Aftermath is on display at the Brooklyn Museum through Feb. 2nd. P.S. If you need a place nearby to decompress after the exhibition and grab a bite to eat, Milk Bar (620 Vanderbilt Ave.) serves super tasty toasties that'll soothe you from the inside. I would think some of those photos were really quick gritty and visceral.